Have I ever mentioned how much I love the BBC Good Food website? Brilliantly photographed food and the recipes just work. Seriously, some recipes aren't even tested in some publications. The usability of the site has been thought about and although I don't use it, it has a binder feature that remembers all your saved recipes. Brilliant for inspiration. 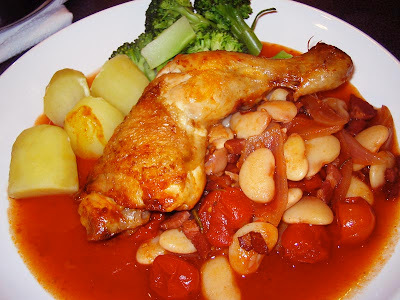 I made this chicken with pancetta and butter beans from it for a family dinner and it went down a storm. It's a kind of take on a chicken cacciatore but a bit snazzier and I particularly love it as butter beans are my new thing. The pancetta really gave the sauce a good smoky flavour and rosemary, tomatoes and chicken go together like a er, horse and carriage. My obsession with the BBC GF site got me thinking. The internet has had me cracking my cookbooks open less often than I used to and there is an ongoing question as to whether the internet has killed them. True, with all the great food blogs out there and instant searchability on offer it is easy to forget about the old faithfuls on the shelf. I love the quick identification for a strange ingredient you have come across or an instant solution to a lumpy sauce crisis you are in. But you will have a hard job getting me to part with my books because they are more than a just a bound collection of recipes. Good cookbooks have a sense of story running through them and a narrative to bind the recipes. They can be so beautifully designed and photographed that they are tactile pieces of art - look at Heston Blumenthal's latest effort designed by Purpose. Stunning. I particularly like the fact you can annotate and personalise your books. My mother's dog-eared, dust jacketless and yellowing copy of her Mrs Beeton Book of Household Management, is full of scribbles and has about twenty casual and hilariously all-Italian (as it's a traditional English cuisine book) recipes handwritten by her on the inside covers. Amongst them a recipe for a much-loved cagionetti recipe from my aunt, another for pickling peppers which reminds me of the pungent, nose singeing vinegar smell in the house when she made them and my dad whingeing about it. Priceless history. You are not going to pass on your saved bookmarks and links are you? Cooks and chefs tend to be incredibly passionate people and I like the lively conversational aspect that the books give. Yes, I know blogs are pure conversation and personality but I see them as a quick catch up in the street, a fleeting hello and lovely to see you where as the books offer a nice long sit down and chat. Both are great and have their place and in fact, some of the more established food bloggers have gone on to publish their own books. There is no going back for me now, the internet is an essential part of my kitchen as the pots and pans but my books are also here to stay in all their ingredient splattered glory. For one you can't cover you laptop in flour and egg and get away with it like a book, can you?